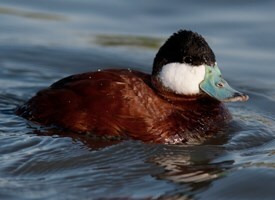 The Ruddy Duck and the New Instagram Logo?? It is a struggle for me to figure out how it is that the Ruddy Duck and the new “Instagram Logo” exist in the same world. Or that one, I being that one, would over hear an 11 yr. old boy talking to another kid while skate boarding on the road between our camp sites at Perrygin Lake State Park. They seemed like such “normal” kids… skate boarding, playing with fire sticks around the camp fire, etc. And what do I hear them talking about….? I don’t know if they saw the Ruddy Duck, or perhaps much else of what surrounded them there in the Methow Valley. We only happened to see this amazing creature with a blue bill, striking black and white head, and gorgeous “ruddy” back, etc. because we walked up the mile-long road that leads from the highway into the campground. There is a pond ½ way to the road, and on that pond are several Ruddy Ducks. We knew nothing of Ruddy Ducks before, but because we happened to meet another couple there by the pond, and he of the couple knew what the Ruddy Duck is and that there were a couple of them in the pond. We had stopped at first because of the cacophony of bird noises; — a symphony was what I called it. Some of the sounds were machine-like, as if amplified electronically. Below is a video of that sound, the call of the Yellow Headed Blackbird. But I am still stunned by this juxtaposition of the experience with the birds in the pond over against the boys on the skateboards and their interest / appreciation for the new Instagram Logo. Compared to either bird, or the two marmots peering over the top of a huge rock who greeted us with a shrill whistle as we moved into the camp site #1, the logo is at best silly. Of course, I am aware of the irony that I am only able to write this and share it with other people, or see those pictures and videos of Ruddy Ducks and Yellow Headed Blackbirds and because of some form of technology, (even if it isn’t Instagram!) So, with this admission that we need, use… are perhaps overly dependent upon technology, I am trying to figure out how these aspects of contemporary life connect, fit together, or some other possible arrangement of coexistence. So far, not so good. I can take in one or the other; the birds or the kids; but like some multidimensional puzzle, I don’t know how to hold them together. Perhaps there are a few advantages to being older and no longer strong enough to do what younger people do, so as to be forced to slow down long enough to have experiences of this kind… magic moments of bird symphony, creature greetings, etc.? This entry was posted in Creation and Technology, God in Creation. Bookmark the permalink.